We are a professional photography company and experienced party animals that have combined our skills to give you a unique and memorable party of your dreams.Stuck for an original, fun and safe birthday party idea? 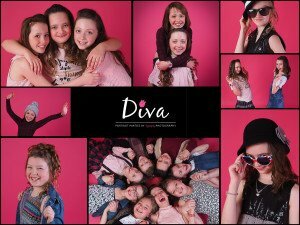 Diva Portrait Party Shoots are a completely new and different idea for girls (or boys!) and their friends in Lincolnshire ! A unique, exciting way to celebrate. Whether you are looking for a special treat for a Birthday, to kick-off prom celebrations, or to just to celebrate – our fun photo shoot parties can really make a special day – to be remembered forever. Whether 8, 11, 13, super sweet 16 or even a hen – everyone will fully enjoy the experience and will have something special at the end of the party to mark the occasion forever. All guests gets a photo to take home, with the rest of the images being put on their own personal, password protected website so that they can share their experience with their family . They can look through their photos at any time and, if they want , buy prints at very reasonable prices. Photos can either be natural lifestyle shots, or glossy studio style – the choice is yours! Be a model for an evening? Teenage girls (particularly), enjoy the experience of a professional photo shoot in a studio setting with all the changes of clothes they want, set to music of their choice with a group of friends to strut their stuff and share the fun with. Todays teens have great ideas of images that might work well. We love to explore their ideas whilst guiding with the key posing techniques used by the models and celebrities of their favourite tv shows and magazines to create stunning images that all will enjoy. A chance to chat about airbrushing and body image and perhaps even show how it works on those annoying teenage skin outbreaks to ensure every child will get an image they can be proud of. Each “model” will get the chance to have some individual portraits as well as fun shots with all the models together. What about a hen party – get some glamorous and gorgeous pictures with the girls, lots of wine (you can bring your own if you wish!) fun music – have a giggle and party the evening away. See our special options below to really add some sparkle into your special night! Once the take-home images are chosen by the guests, while we are busy producing the guests complimentary photo gift and the hosts framed personalised magazine cover, everyone can all retire to our very own “Party bar” where a selection of non alcoholic drinks (if you are under 18!) and nibbles will be waiting – including its very own projector so if you want music videos, karaoke or dancing – you can! Its party time!! Parents can bring a birthday cake if they wish, or party bags – anything to help your party along! Makeover – why not have a beauty makeover before the shoot? A local make up artist who will pamper you before your shoot – makeup, and hair styling and it will be tailored appropriately according to the age of the guests ! Non – Alchoholic Mocktails try our wonderful celebratory creations with brollies, swizzle sticks and all that razz – over 18’s can bring their own additions :)! Hot tub – yes if you really want to enjoy the whole indulgent and incredibly unique party superstar experience why not finish off your shoot with an hour in the hot tub with a glass of teenage fizz? Fluffy dressing gowns provided but please bring your own costumes and towels. Click here for details of how much it will cost for the party experience everyone wants! Note for Parents – yes it is all safe – we have full public liability insurance, all activities are supervised and are fully CRB checked – we also ensure that any party held with children under 18 is attended by a parent. Its ok – we’ll make sure the parent has fun too! The parents can join in too – if they want to!! How to book – please ring first to ensure that your party date is free 01529 241633 or fill in the contact form – we can then discuss how we can make your party extra special – a £30 deposit will secure the date then pay the balance on the day of the party.